I did not know that there can be such a service in Orekhovo-Zuevo. We have been in many cafes and restaurants, but it is the best , the staff, service, well done. The best cure for fatigue and bad mood is the time spent with great pleasure. Your pleasure is our best reward. In the «Zuevsky» you can enjoy a light breakfast with a charge of vivacity for the whole day. We also offer business-lunch for business people. Lunch’s menu changes every day. For a romantic or festive dinner recipes are collected from all over the world, spices cooked with bright accents, we use traditional and delicacies products. Working on new dishes is a permanent process, many of them get new sounding . Quality is a high- priority question for the restaurant. In Gostiny Dvor «Zuevsky» official celebrations, family and children’s events, noisy birthday parties and corporate events are held. The restaurant complex has all the best conditions for this. 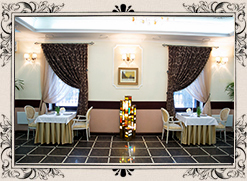 The highest standards of service and reasonable prices make the Gostiny Dvor «Zuevsky» attractive to the guests. 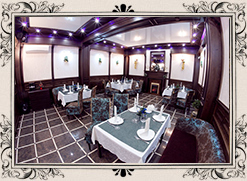 Virtual tour of the Guest House "Zuevsky". Photos of our hotel and restaurant.